Autumn can be such a nice season – if the weather is like this typical Indian Summer! Last weekend I was able to do most of my gardening work in preparation for winter and also cut the grass for the last time this season and stored away my sun loungers. Sadly as I haven’t used them much this year. But I kept my outdoor furniture on my terrace as we still expect some nice, sunny days. Another busy week in the office before I will visit my son who is studying in Northern Bavaria, over the weekend. I really look forward to spending time with him! My next trip will be to London in November where my daughter is studying. I have been to London many times, commuting back and forth over a couple of years and always love going back. I promise to share outfit posts and a few „insider“ tipps! 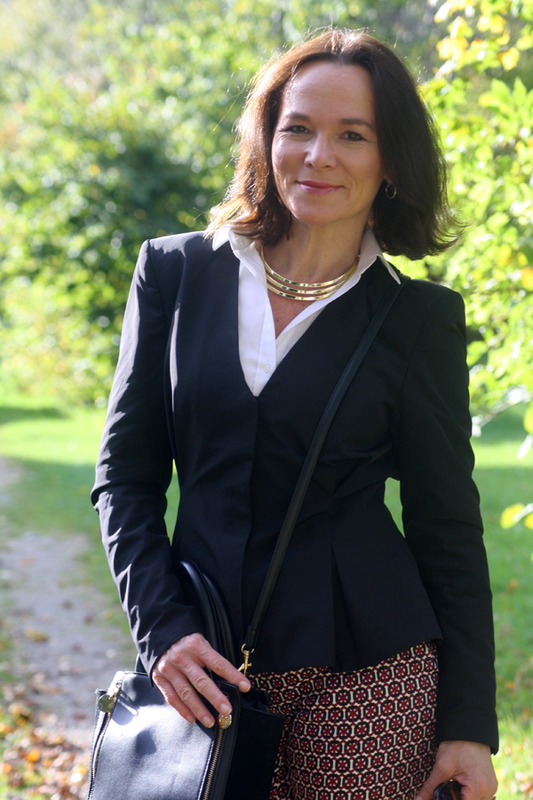 I have worn this outfit with my black peplum blazer and cropped printed trousers to the office and again I am sporting my new golden necklace by eternal collection which I have shown you in a more elegant style in my last post here. Der Herbst kann so schön sein… an Tagen wie diesem typischen Altweibersommer! Letztes Wochenende habe ich meinen Garten winterfertig gemacht und zum letzten Mal dieses Jahr Rasen gemäht. Und leider auch meine Liegen in den Keller geräumt, die ich diesen Sommer viel zu selten nutzen konnte. Aber meine Terrassenmöbel habe ich stehen lassen, denn ich hoffe auf weitere schöne, warme Herbsttage! Diese Woche habe ich im Büro noch viel zu tun, aber ich freue mich schon jetzt ganz besonders auf das Wochenende, das ich mit meinem Sohn in Bayreuth verbringen werde, wo er studiert. Anfang November steht dann mein Flug nach London an, ich besuche meine Tochter, die dort studiert. Ich bin einige Jahre zwischen München und London gependelt und liebe die Stadt! Umso mehr freue ich mich darauf, mit Alena ihre Lieblingsplätze und Restaurants zu erkunden und verspreche Euch natürlich auch Outfitposts und Insidertipps! Love your modern and chic look! Those pants are so vibrant. I hope you have a great time with your son! Beautiful outfit! That necklace is just gorgeous!!! I love your look today. You are beautiful, elegant and chic. As perfect as usual. The combination of colors and clothes suit you much. Liebe Annette, sehr chic, dein Bürooutfit. Würde ich auch so tragen. Beide Daumen hoch. Viel Spaß mit deinen Kindern, sie zu besuchen, ist doch immer wieder schön. Ich besuche einen meiner Söhne, auch bald in Regensburg. What a chic look on you. I love it. Liebe Annette, sehr genial… eine ähnliche Hose hatte ich vergangenen Sonntag auch getragen. Musterhosen finde ich total toll… sie machen ein scheinbar „normales“ Outfit gleich zu etwas Besonderem … und Deine hat so eine geniale Farbe… 🙂 Ich hoffe auch sehr auf noch ein paar schöne Tage… wenigstens eine kleine Entschädigung für diesen seltsamen Sommer. This is an elegant outfit too. Love it. Still cannot believe it when it says „H&M“. You make everything you wear look so expensive. Nice touch that bracelet with the necklace. Liebe Annette, na da hast du ha einiges vor in den nächsten Wochen. Wird bestimmt aufregend für dich. Dein heutiges Outfit ist schick aber doch legere, so mag ich es. 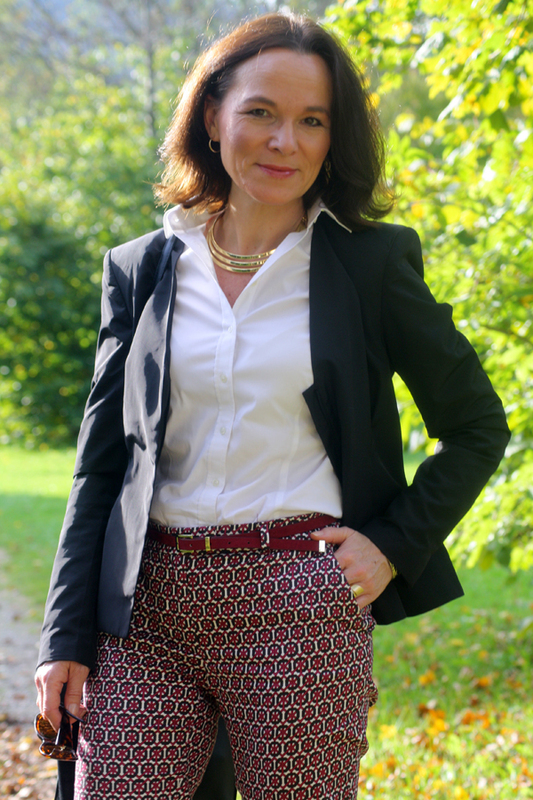 Die gemusterte Hose passt super zur schwarzen Jacke. Aber ich kann mir die Hose auch im Winter ganz toll mit einem dicken, beigen Pullover vorstellen. Ich wünsche dir jetzt schon mal eine schöne Zeit mit seinem Sohn. Vor deiner London reise werden wir uns sicher noch ein paar Mal hören. My recent post Long Oversized Coat! Annette die Hose mit dem fantastischen Muster steht dir wahnsinnig gut. Ich bin ganz sprachlos wie toll der Print an dir aussieht. 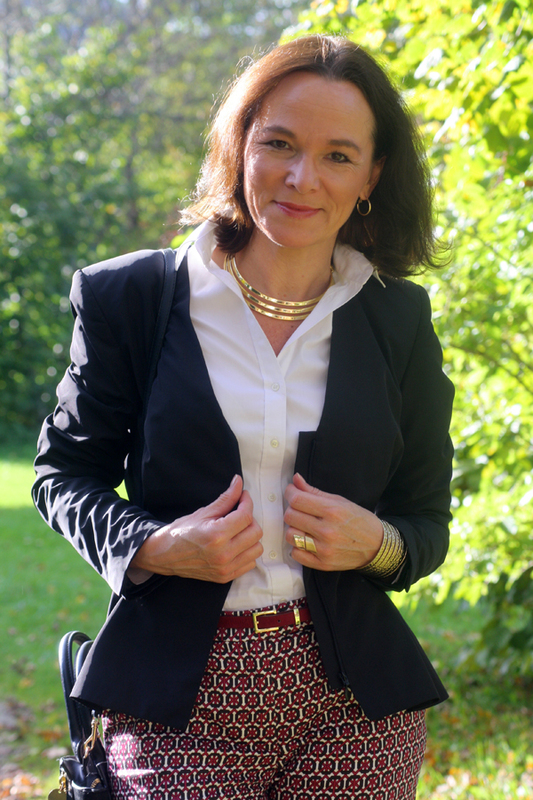 Perfekt kombiniert mit dem schwarzen Blazer steht sie im Fokus und umspielt deine tolle Figur!! Wirklich eine Klasse für sich!! Bayreuth? Hört sich wirklich toll an. Ich wünsche dir schonmal ganz viel Spaß mit deinem Sohn. Annette, I love the pattern pants, especially paired with the other classic pieces. It is a perfect look for the office. Great classic look! I love those pants. The pattern is very fun. Sensacional look!!! Tu pantalón es divino!!! this is a great look for the office. I love the printed pants!